“So you desire a prophecy, my curious visitor?” Well, you’re in the right place! Indeed, Vikings by NetEnt is a November 2018 release, and it offers a lot more than “stones and bones”. In fact, this game takes its inspiration from the popular HBO series and its perhaps one of the most anticipated game by NetEnt this year. Given the fact that this slot offers a staggering 78,125 ways to win in the Free Spins bonus and several unique features. There’s a good chance you could end up raiding the casino you play at if you’re lucky! So, keep on reading to know more about this truly stunning game! Bonuses & features: Stacked symbols, Hot Spots, Free Spins, and Random Symbols paring (Shield Wall). Highest-paying symbol: 7 V symbols on an active paylines reward you with 70 coins. First, before we venture deeper into the world of Vikings and tell you more about the game’s features. It’s worth knowing that this slot offers two different sets of reels! In fact, the base game plays on 5 reels and 3 rows with 243 pay lines. And the Free Spins bonus, on the other hand, plays on 7 reels and 7 rows with up to 78,125 bet ways. 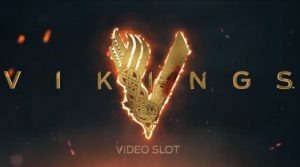 Is a feature we’ve seen in NetEnt games before, however in Vikings Video Slot they’ve updated it. In fact, both the base game and the Free Spins bonus have Hotspots. The base game only has one, and the Free Spins bonus has 3. In both cases, the hot spots are illuminated on the central reel(s). To sum up, the key feature of a hotspot is to duplicate identical symbols on the reels. In fact, whenever a Stacked symbol of a character lands on the hotspot, it’ll replace all other characters on the reels to frequently create a winning combo. You’ll trigger 7 Free Spins with the help of 3 “Raid Spins” symbols. And brace yourself when you trigger this feature because you’ll play on a whopping 78,125 ways to win, on 7 reels and 7 rows! To conclude, after testing this game we’re happy to say that NetEnt did a fantastic job at bringing to life the TV show. The gameplay reserves many surprises and has an incredibly high number of bet ways. So, it compensates for the fact that the paytable is not the highest. Plus, it means that the true fans of Vikings will certainly enjoy this slot since the wins are quite frequent due to the multiple pay lines you can create a winning combo on! Try this new slot now and have fun!